Are you not enjoying life like you used to? Do you feel stuck and not know how to change how you are feeling? At CBT London Therapy we are accredited CBT Therapists who specialise in offering therapy on-line to help you to improve how you are feeling and help you get back to enjoying your life again. We know that life is very busy and finding time to attend appointments can be difficult. We are also aware that those living abroad may not have access to English speaking therapists. We offer sessions via Skype to make it possible for you to access help no matter where you are, at a time that is convenient for you: whether that be from the comfort of your own home or in the office after work, even while you are on holiday or working away. We offer sessions in the evening (UK time) and at weekends, but we may also have availability at other times. Feel free to contact us to check our availability. We will work together with you to help make sense of your difficulties to help you to improve how you are feeling and get back to enjoying your life again. Cognitive Behavioural Therapy (CBT) is a talking therapy which has been shown to be highly effective in helping people who are experiencing a wide range of difficulties. 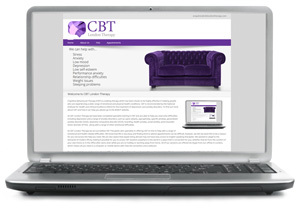 At CBT London Therapy we have completed specialist training in using CBT to help people overcome depression and a range of anxiety disorders, such as: panic attacks, agoraphobia, specific phobias, generalized anxiety disorder (GAD), obsessive compulsive disorder (OCD), hoarding, health anxiety, social anxiety, post-traumatic stress disorder (PTSD). CBT is recommended by the National Institute for Health and Clinical Excellence (NICE) for the treatment of depression and anxiety disorders. To find out more about CBT and how it can help you please go to the BABCP website. Breaking unhelpful patterns: CBT is about looking at your current patterns of thinking and reacting in situations and whether these are helpful or unhelpful. We will help you explore and experiment with different ways of thinking and reacting. Collaborative: CBT is not something that happens to you. You will work alongside your therapist to discover more helpful ways of thinking and reacting in different situations. Goal Orientated: CBT is about making changes. At the beginning of treatment we will help you to identify what changes you want to work towards and what specifically you would like to be different. Non-judgemental: CBT is not about looking at what you are doing “wrong” but rather finding more helpful ways that you can react to difficult situations. Practical: CBT is a very practical approach. Together with your therapist you will be thinking about ways of making practical changes in your life and then practicing these in between sessions. Present focused: CBT is primarily present focused, that is, we focus on the difficulties you are experiencing on a day to day basis. We do talk about experiences of the past and how they may have affected you but this will not be the focus of our sessions together. Short-term: CBT has been found to be an effective short-term therapy with clients needing anywhere between 4-20 sessions. The idea is that the skills you learn in your sessions equip you to become your own therapist. If you would like to arrange an appointment or just to find out more about CBT and how we might be able to help you, please contact us enquiries@cbtlondontherapy.com to arrange a free confidential initial consultation. We are accredited by the British Association for Behavioural and Cognitive Psychotherapies (BABCP), which is the lead organisation for CBT in the UK.